Well, knowing we're all males, i have organised a team-based activity.... LOL JK. this is a map i have created using state of the arts programs for the SAS strike forces. 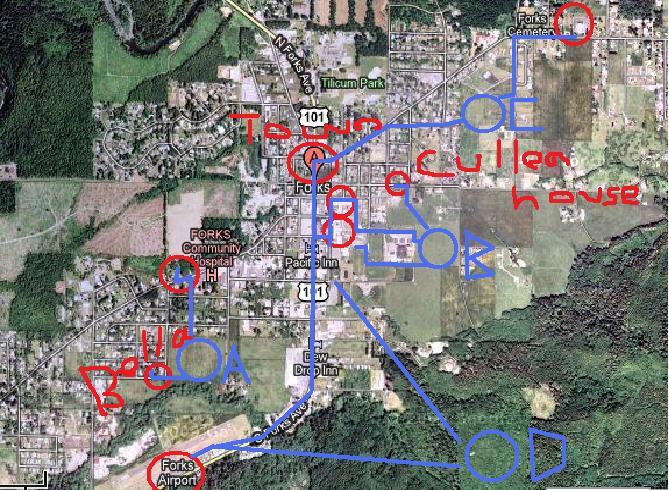 The plan is to bomb forks, capture specific strong points, and above all, kill the Cullen rebels. Task force A drops from black hawks into the open field and move to secure Bellas house and then the secondary target with a smaller force to take the hospital. Task force B, the largest and strognest, drops off heavy armour from sea kings and black hawks including tank columns of Challenger 2 battle tanks. Two coloumns of heavy armour and infantry move to capture the police station and high school. The plan is to capture valuable information on vampires from school books, before calling in an airstrike from airbourne division of task force D. A third, a foot-mobile heavy platoon will move to assault the cullens house, expect major resistance from vampires, taks force C can move to asisst. Task force C, quickly drops into the open field north-east of the main town via choppers, one force move of infantry move to secure the cemetary where most vampires may be to protect their ancestroy. They'll use incendiary explosives and mortars to level all vampire graves. A second force of a platoon and heavy armour will move in to help capture the square and assist in any resistence given at the polcie station or school. Task force D will arrive 5 minutes late over the mountain, as they scout for vamprie reinforcemnts from the local river, and then drop infantry to capture the airport, to prevent any escape routes. wings of little birds have been attached to ask force D to assist in any rough resitance, Tornado fighter-bomers are on standby ready to level the school and police station. Once the airport is taken, they will move to assist the other task forces in capturing the main square, where we expect the highest level of resistance. If any, destroy vampire breeding pits outside the town in the forest, may introduce a second battle plan and mission if taking the town takes our forces too much. And one thing, Sea Kings and Blackhawks cannot carry anything but troops. Armour is dropped by Hercules, and even then, it is specialised. What the hell is this thing about anyway? Remember, insulting any icons in the real world or otherwise is against the rules, and while this is a bit of fun now, if it becomes insulting or offensive, then action will be taken. I'll nab up Task Force C before anyone else nabs the last armour. I love tanks... You should see me on Bad Company 2. Do actually read anything I post? I acknowledged that this is a bit of fun, but it is NOW. If, and that is IF, this gets insulting/offensive, then there will be consequences. ooh, a bit of a spiral off-topic there, zak? Michael, that was just spiteful and completely uncalled-for. He is entitled to an opinion, and since his opinion was in relevance to the Original Post, then he was not off-topic. it's just the fact that just about every time zak posts something directed towards me, it is nearly always negative, regardless of whether i was slagging something else off or not. and do you honestly regard that as spiteful? He has previously commented that you are 'off-topic', and he posts something that you regard as 'off-topic' but isn't actually, but you say it anyway. Therefore, it is spiteful. it's called a 'joke'. 'j-o-k-e'. Now that is being condescending. Michael, that was blatently not a joke, your are just being stupid. You can't admit your wrong and always have to get revenge. Your just extremely spiteful and aggressive. Oh and FYI your the one always slagging other people off. Please! Back on topic! Slag each other off face to face if you so sorely need to. Otherwise don't. Another post from Firenze productions. Sounds like a good map battle though! Ok, first of all, if you're going to post multiple times in a row, please edit your posts rather than repeatedly post.